PHOTO: On Friday evenings, follow the rhythmic beats to Pritchard Park for the Asheville Drum Circle. 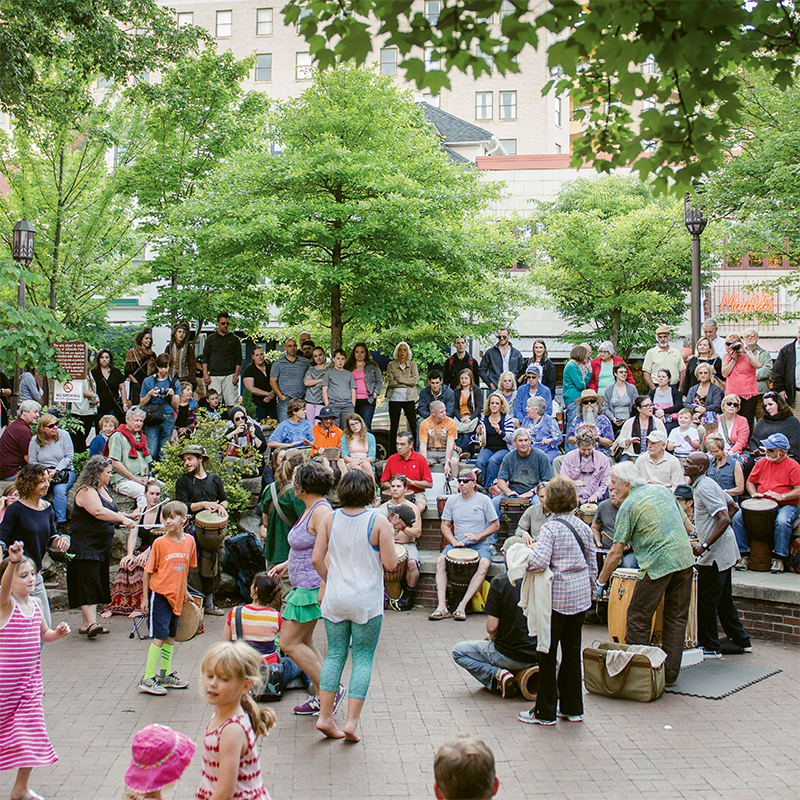 On most Friday nights in downtown Asheville, rhythmic drum beats echo through the streets. As you crest Patton Avenue and Pritchard Park comes into view, the source of the hypnotic sound is revealed: the Asheville Drum Circle. If the mountains had a theme song, it would surely include the pluck of a banjo. And during the summer, novice pluckers and experts alike can hone their skills at Warren Wilson College’s annual Swannanoa Gathering. During July and into August, musicians focus on concentrations such as Traditional Song (July 1–7), Celtic (July 8–14), and Contemporary Folk (July 22–28) with regionally and nationally recognized experts. Each week’s coursework spans a spectrum that appeals to players of all experience levels and interests. For example, a fiddler’s schedule might include a morning class on the techniques, a midday study of dances narrated by fiddle tunes, and an afternoon seminar on the folklore behind the instrument. In the evening, students gravitate to jam sessions, staff performances, and dances. Attendees can stay on campus for the true summer-camp experience (approximately $1,000 including classes, housing, and meals), or rent a room in nearby Asheville for a taste of the city life. The faculty, made up of some of the who’s-who in the music world, both instruct and collaborate with students, leading to synergic performances. And it’s to these concerts that fans flock. Throughout June, July, and August, students and their mentors (like Conrad Tao, Steep Canyon Rangers, and R.E.M.’s Mike Mills) perform in some 80 concerts in the open-air Whittington-Pfohl Auditorium. The festival spans genres with operatic performances and dance numbers, too. This year, fine music aficionados can also enjoy the Festival Within a Festival, which celebrates the centennial of Leonard Bernstein with classical, chamber, opera, and Broadway performances, as well as readings and lectures. Performances through August 18.